The first day of the Mr Oil Wexford Senior, Masters and Novice T&F Championships was held in close to perfect conditions last Wednesday at the Enniscorthy Sports Hub. The programme also included Javelin and Triple Jump for the older underage categories. The relaxed nature of the event is such that athletes are happy to try multiple events. A good competitive edge was injected into proceedings as a result of a number of U17 athletes taking advantage of the rule allowing them to compete at Senior level. There were eye-catching performances throughout the evening. Guest runner Simon Archer (Finn Valley) looked a class apart as he won the Senior 200m. He was followed home by Shaun Donohue of Menapians, the latter claiming the County title. Shaun, who also won the 800m, was one of only two individual dual Gold medal winners. 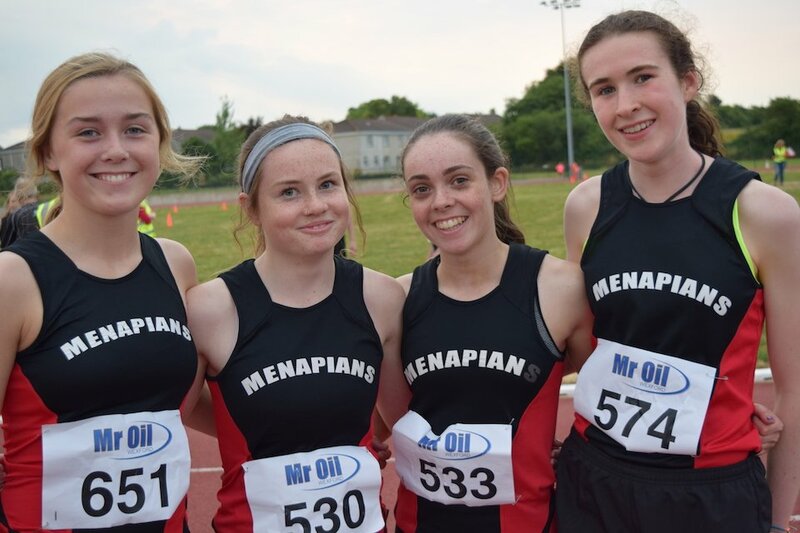 The other was fellow Menapian Róisín O’Reilly who was enjoying her first outing at Senior level. 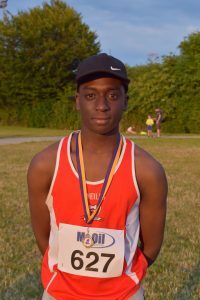 The teenager won both 800m and 3000m. Another young runner to impress was Enniscorthy’s Blanaid Fogarty. She was a convincing winner of the Senior Women’s 200m. No less impressive was Menapians speedster Suzie Brennan, another U17 athlete, who ran the perfect race to take the Novice 100m title. In doing so she relegated Blanaid to the runner-up spot. 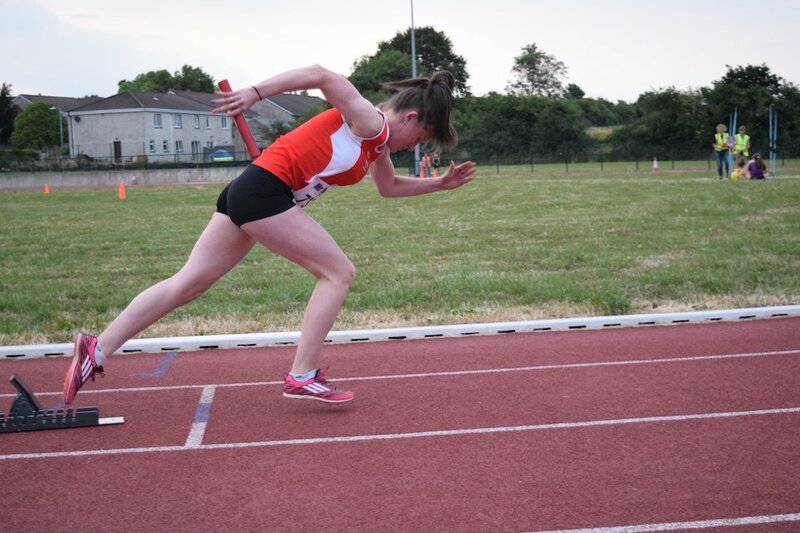 The Enniscorthy girl picked up another pair of Silvers, finishing 2nd to Tara Doyle (Adamstown) in Triple Jump and 2nd to Rachel Power (Adamstown) in U17 Javelin. In a good evening for the Powers of Adamstown, Zara Power won both Senior Shot and U19 Javelin; Rachel Power won U17 Javelin, was 2nd in Senior Javelin and was 3rd in Senior Triple Jump. Adamstown’s strength in field events was further shown by Sonia Mooney’s win in both Senior and U18 Javelin. 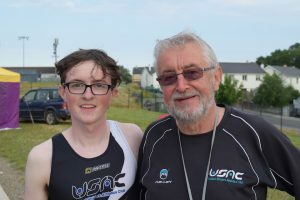 There were 100m wins for father and son duo Jimmy and Shane O’Neill, the former in his swansong Championship performance at Masters level and the latter in the Novice. DMP veteran Ann Sullivan showed that her engine is as good as ever as she led from the front to win the 1500m. 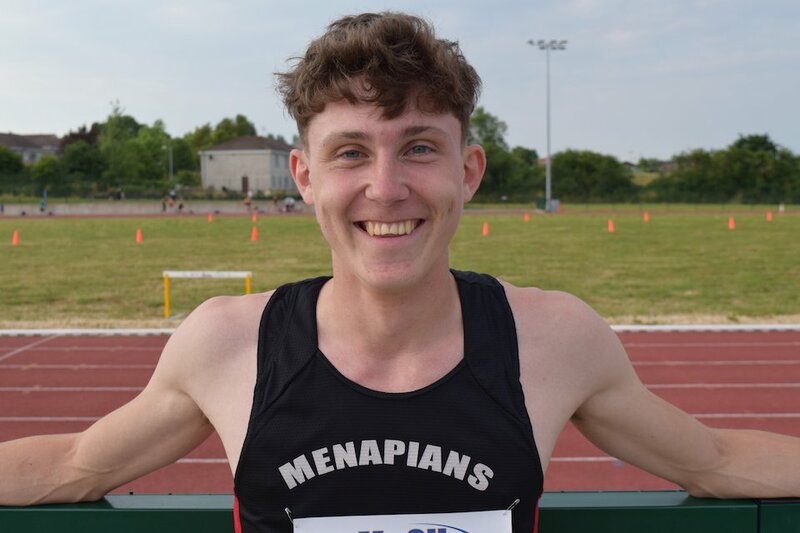 It was a similar story for Niall Sheil (St Killian’s) in the Masters Men’s 1500m. 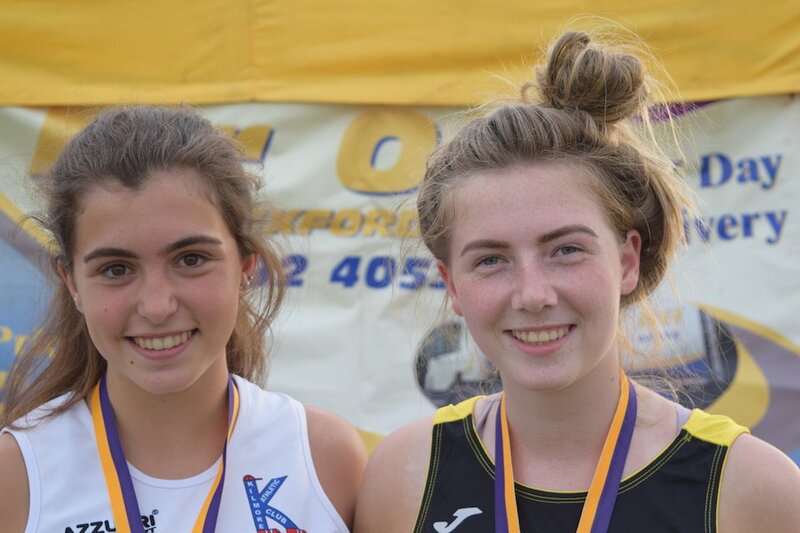 Croghan AC’s sole Gold medal of the evening went to Emer Quintero in the Novice 1500m. She also picked up Bronze in the 400m. 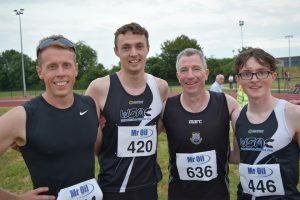 John Stone (DMP) won both the Novice Men’s 1500m and Masters 400m. Aaron Browne (United Striders) claimed the Novice 400m title, winning in a respectable 54.7s. Maeve Hayes of St Paul’s won the Novice Women’s 400m. 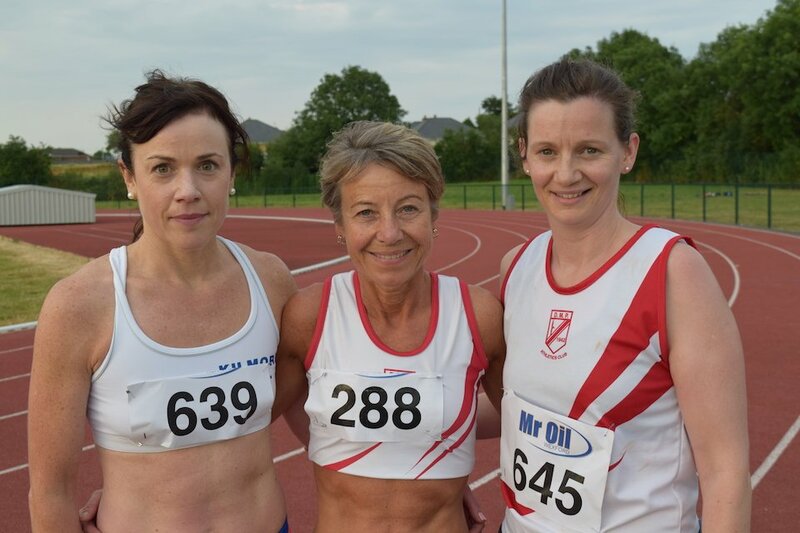 Emily Waldron (Enniscorthy) took the Gold in both Masters 400m and 100m as well as placing 2nd in Senior 800m. 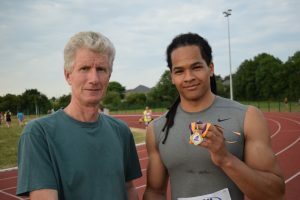 Hurdling specialist Aaron Tierney Smith, the only competitor in the Senior 110m Hurdles, gave what was in essence an exhibition run. He also placed 2nd in Senior 200m and U19 Triple Jump. His clubmate Shane O’Neill looked good in winning the Novice 100m. 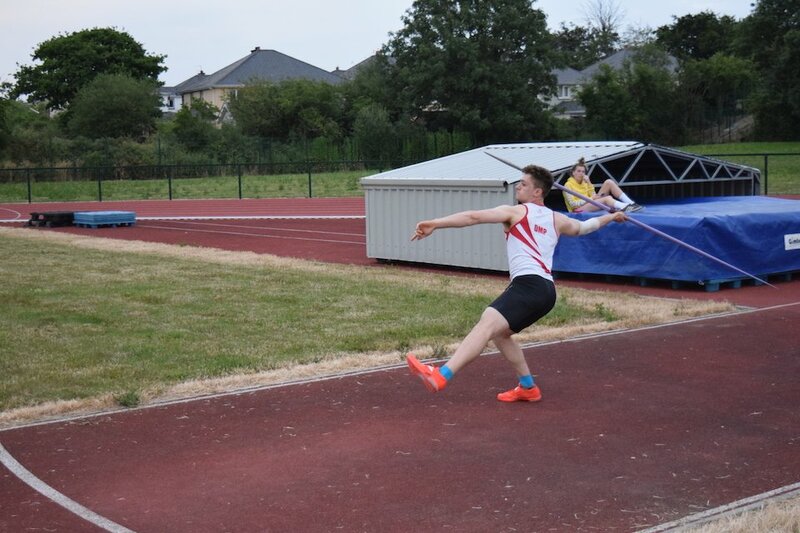 Peter O’Shea (DMP) launched the Javelin out to 57.23m, a PB, to take the County title ahead of Enniscorthy’s Peter O’Connor. The latter won the Senior Shot by a good margin. The Senior 4x400m Relays brought the evening to a close. The Menapians quartet of Róisín O’Reilly, Suzie Brennan, April Keeling and Liadh Dwyer took the Women’s title in some style ahead of Striders and Enniscorthy. The Striders team of Aaron Browne, Gavin Kelly, Nic Walkden and Paul Doran won the men’s race ahead of Kilmore. Championship action continues at the same venue this Wednesday from 6.30pm. There is a jam-packed programme of very exciting events on both track and field. This is your last chance of the Summer to see the county’s top athletes, along with guests from further afield, in action. The winner of the perpetual Br. Egan Cup for top club will be announced at the end of the evening. Tagged Masters and Novice T&F Championships, Masters and Novice T&F Championships RESULTS, Wexford Senior, Wexford Senior T&F 2018. Bookmark the permalink.